Download "Statements of Learning for Information and Communication Technologies (ICT)"
2 ISBN-13: ISBN-10: SCIS order number: Full bibliographic details are available from Curriculum Corporation. Published by Curriculum Corporation PO Box 177 Carlton South Vic 3053 Australia Tel: (03) Fax: (03) Website: Curriculum Corporation, 2006 on behalf of its members All rights reserved. The were managed by Australian Education Systems Officials Committee (AESOC) on behalf of the Ministerial Council on Education, Employment, Training and Youth Affairs (MCEETYA), and developed by Curriculum Corporation. Acknowledgements National Consistency in Curriculum Outcomes Steering Committee Ken Smith (Chair) Director General Education Queensland Gary Barnes (Executive Officer) Assistant Director General Education Queensland John McIntyre Acting Manager of Curriculum Renewal Australian Capital Territory Department of Education and Training Lesley Lobel Deputy Director General New South Wales Department of Education and Training Debbie Efthymiades Director, Curriculum Northern Territory Department of Employment, Education and Training Terry Woolley Director, Learning Outcomes and Curriculum South Australian Department of Education and Children s Services David Hanlon Deputy Secretary, School Education Tasmanian Department of Education John Firth Chief Executive Officer Victorian Curriculum and Assessment Authority John Gougoulis Manager Curriculum Improvement Program/Professional Learning Western Australian Department of Education and Training Project management Joan Holt, Project Director Di Kerr, Project Manager Howard Kennedy, Writer Manager Peter White, Writer Russell Phillipson, Writer Copying for educational purposes The Australian Copyright Act 1968 allows a maximum of one chapter or 10 per cent of this book, whichever is greater, to be copied by any educational institution for its educational purposes, provided that the educational institution (or the body that administers it) has given a remuneration notice to Copyright Agency Limited (CAL) under the Act. 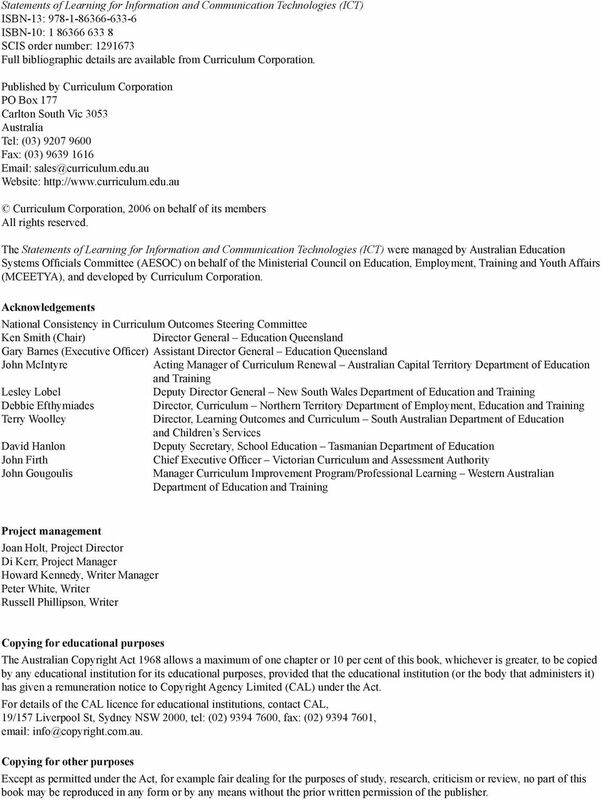 For details of the CAL licence for educational institutions, contact CAL, 19/157 Liverpool St, Sydney NSW 2000, tel: (02) , fax: (02) , Copying for other purposes Except as permitted under the Act, for example fair dealing for the purposes of study, research, criticism or review, no part of this book may be reproduced in any form or by any means without the prior written permission of the publisher. 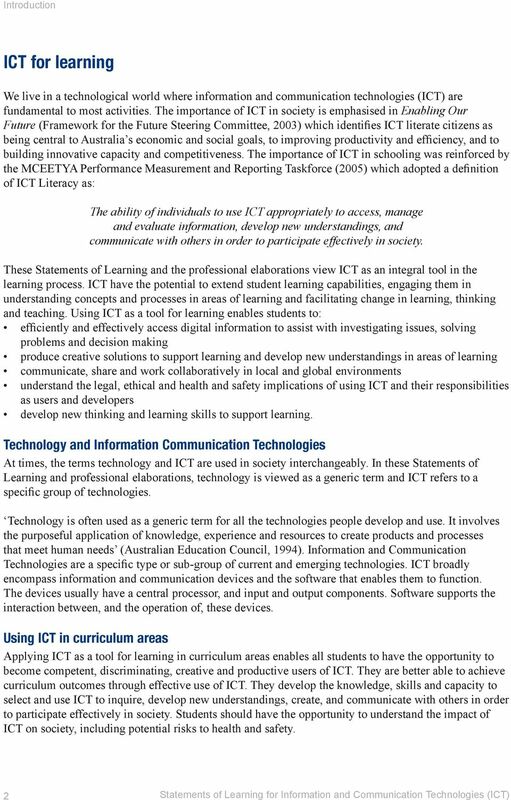 5 Statements of Learning for Information and Communication Technologies (ICT) Introduction This document,, hereafter called in the text Statements of Learning for ICT, is the result of collaborative work by Australian education jurisdictions to achieve greater consistency in curriculum. It sets out the knowledge, skills, understandings and capacities that students in Australia should have the opportunity to learn and develop in the ICT domain. Statements of Learning for ICT is not a curriculum in itself. Instead, it contains a series of statements about essential opportunities to learn in this particular domain which education jurisdictions have agreed to implement in their own curriculum documents. As such, this document is primarily intended for curriculum developers. It is not the express intent that the document is promoted directly with teachers or the general community. Statements of Learning for ICT is not a list of all possible opportunities to learn within the ICT domain. It contains only those opportunities which all education jurisdictions agree should be consistent across Australia. 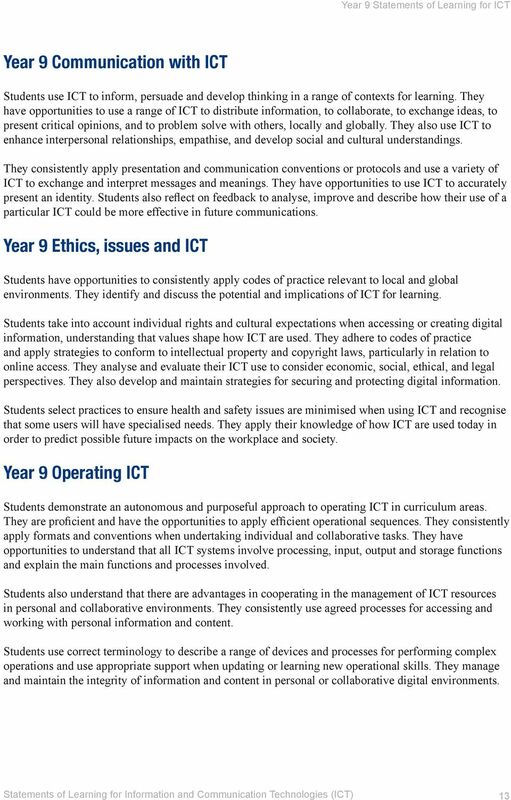 Jurisdictions own individual curriculum documents will likely include additional aspects of ICT. Statements of Learning for ICT contains two critical elements: the Statements themselves and their professional elaborations, which work together as a package, with the Statements also represented in expanded form in the professional elaborations. The Statements are written in a plain English form which allows them to be engaged with by a broad audience if required. 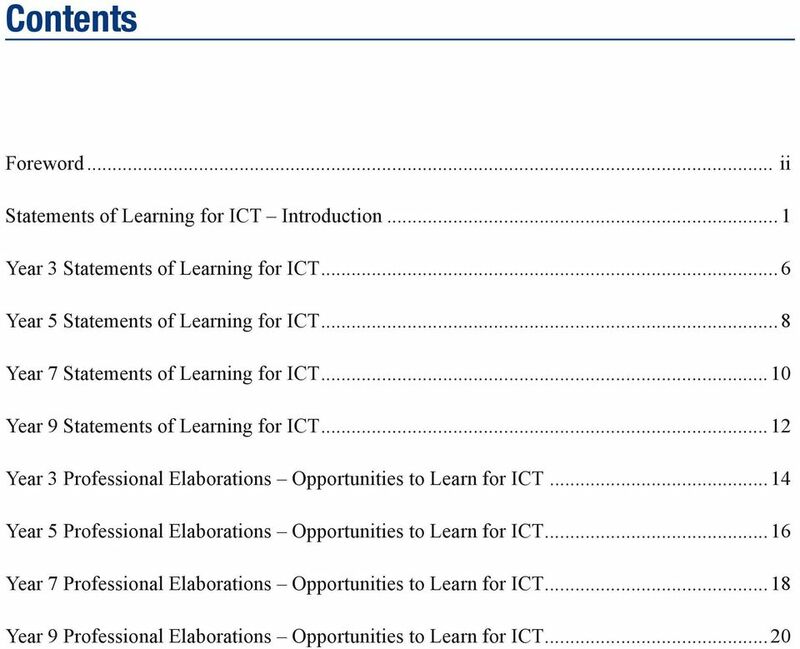 As the name suggests, the professional elaborations use the professional language of the ICT curriculum domain. Underpinning the Statements and professional elaborations package within the Statements of Learning for ICT is the idea of an opportunity to learn. The opportunities to learn set out in this document are those opportunities seen as reasonable, challenging and appropriate. Reasonable means it is realistic to expect that most students will have actually achieved the learning within a reasonable period of their first having the opportunity to learn. Up to two years can be considered reasonable for students. Challenging means that the opportunities will be a stretch and thus they represent somewhat more than a proficient student could be expected to learn initially. Appropriate means that the opportunities are suitable for the majority of young Australians to experience. The opportunities to learn in the Statements and professional elaborations sections have been developed for four year junctures the end of years 3, 5, 7 and 9. Most of the curriculum documents of Australian education jurisdictions are organised in bands, levels or stages rather than in year junctures and so the opportunities to learn in this document will most likely be included in jurisdictions curriculum documents in the band, level or stage where the year juncture falls. The opportunities to learn in the Statements and professional elaborations sections are also structured around broadly defined aspects of ICT, known as conceptual organisers. They provide coherence and structure for this document. In implementing the opportunities to learn, jurisdictions will use whatever organisers suit their curriculum documents best. 6 Introduction ICT for learning We live in a technological world where information and communication technologies (ICT) are fundamental to most activities. The importance of ICT in society is emphasised in Enabling Our Future (Framework for the Future Steering Committee, 2003) which identifies ICT literate citizens as being central to Australia s economic and social goals, to improving productivity and efficiency, and to building innovative capacity and competitiveness. 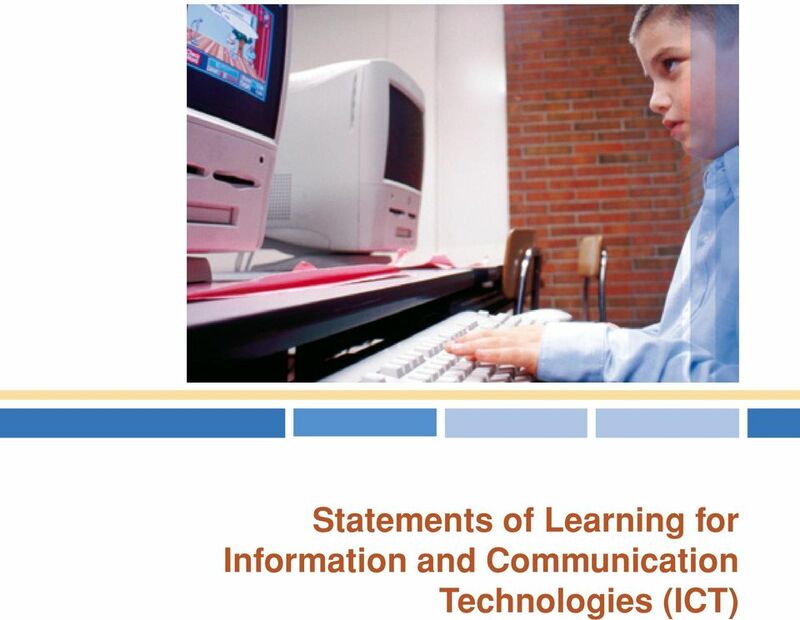 The importance of ICT in schooling was reinforced by the MCEETYA Performance Measurement and Reporting Taskforce (2005) which adopted a definition of ICT Literacy as: The ability of individuals to use ICT appropriately to access, manage and evaluate information, develop new understandings, and communicate with others in order to participate effectively in society. These Statements of Learning and the professional elaborations view ICT as an integral tool in the learning process. ICT have the potential to extend student learning capabilities, engaging them in understanding concepts and processes in areas of learning and facilitating change in learning, thinking and teaching. Using ICT as a tool for learning enables students to: efficiently and effectively access digital information to assist with investigating issues, solving problems and decision making produce creative solutions to support learning and develop new understandings in areas of learning communicate, share and work collaboratively in local and global environments understand the legal, ethical and health and safety implications of using ICT and their responsibilities as users and developers develop new thinking and learning skills to support learning. Technology and Information Communication Technologies At times, the terms technology and ICT are used in society interchangeably. In these Statements of Learning and professional elaborations, technology is viewed as a generic term and ICT refers to a specific group of technologies. Technology is often used as a generic term for all the technologies people develop and use. It involves the purposeful application of knowledge, experience and resources to create products and processes that meet human needs (Australian Education Council, 1994). Information and Communication Technologies are a specific type or sub-group of current and emerging technologies. ICT broadly encompass information and communication devices and the software that enables them to function. The devices usually have a central processor, and input and output components. Software supports the interaction between, and the operation of, these devices. Using ICT in curriculum areas Applying ICT as a tool for learning in curriculum areas enables all students to have the opportunity to become competent, discriminating, creative and productive users of ICT. They are better able to achieve curriculum outcomes through effective use of ICT. They develop the knowledge, skills and capacity to select and use ICT to inquire, develop new understandings, create, and communicate with others in order to participate effectively in society. Students should have the opportunity to understand the impact of ICT on society, including potential risks to health and safety. 7 Introduction Jurisdictions and schools may also provide the opportunity for students to undertake further specific studies in specialised fields of ICT interest or areas relating to post-school opportunities. These specialist fields of study are not the subject of these Statements of Learning or professional elaborations. ICT curriculums across Australia The Statements of Learning and professional elaborations draw upon the following aims which are a synthesis of introductions, rationales, aims and objectives from curriculum documents across Australia. 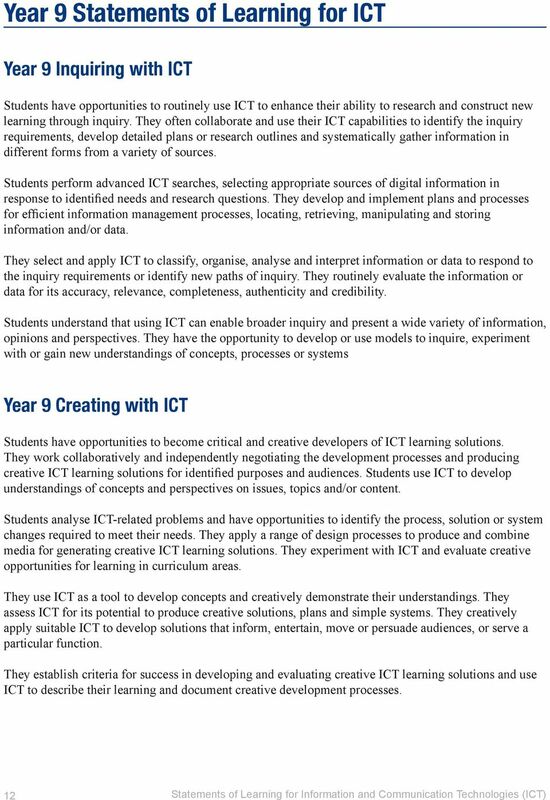 Generally, ICT curriculums across Australia intend students to have the opportunity to: use ICT to support inquiry, through the accessing, selecting, organising and interpreting of information and data learn with ICT to create new understandings create ICT solutions by selecting appropriate ICT, generating ideas, planning, monitoring and reflecting use ICT creatively and imaginatively collaborate and communicate through the effective use of ICT become discriminating, ethical, legal, responsible and safe users of ICT operate a range of current and emerging ICT to support and enhance learning in curriculum areas. This analysis informed the process of generating the five conceptual organisers: Inquiring with ICT; Creating with ICT; Communicating with ICT; Ethics, issues and ICT; and Operating ICT. 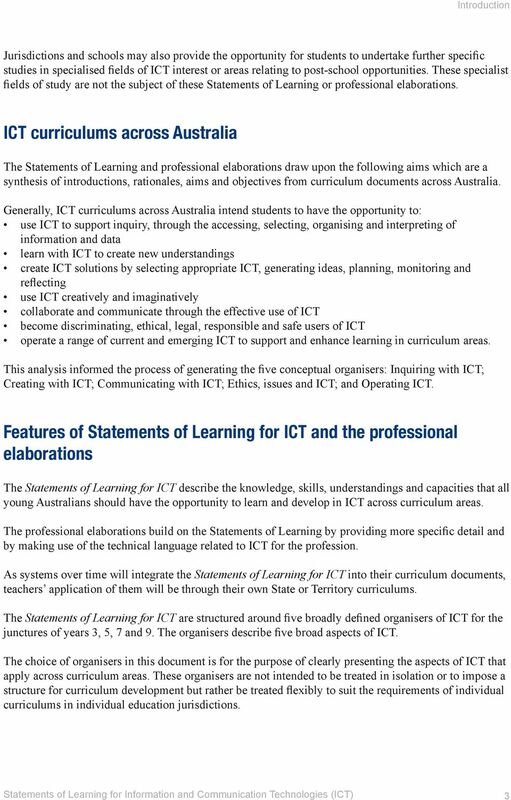 Features of Statements of Learning for ICT and the professional elaborations The Statements of Learning for ICT describe the knowledge, skills, understandings and capacities that all young Australians should have the opportunity to learn and develop in ICT across curriculum areas. The professional elaborations build on the Statements of Learning by providing more specific detail and by making use of the technical language related to ICT for the profession. As systems over time will integrate the Statements of Learning for ICT into their curriculum documents, teachers application of them will be through their own State or Territory curriculums. 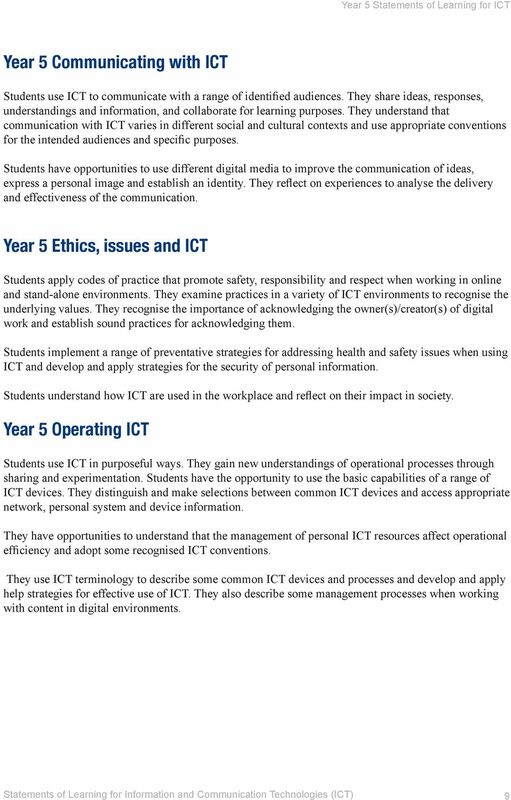 The Statements of Learning for ICT are structured around five broadly defined organisers of ICT for the junctures of years 3, 5, 7 and 9. The organisers describe five broad aspects of ICT. 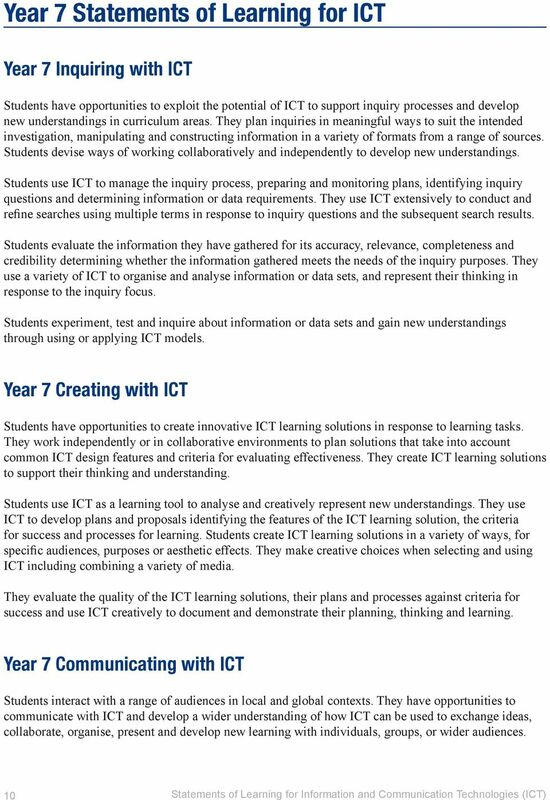 The choice of organisers in this document is for the purpose of clearly presenting the aspects of ICT that apply across curriculum areas. These organisers are not intended to be treated in isolation or to impose a structure for curriculum development but rather be treated flexibly to suit the requirements of individual curriculums in individual education jurisdictions. 8 Introduction The organisers are interdependent and may integrate in a variety of ways depending on many factors that may apply in education jurisdictions. Figure 1 represents this integration and interdependence. Depending on the context, the prominence of the organisers involved will vary. Figure 1: The relationship between the conceptual organisers of ICT Inquiring with ICT Students use ICT in processes of inquiry and research. They identify information and data needs and plan actions to locate, access and retrieve information and data. Students organise, manipulate, structure and refine information to improve their interpretations and construct new understandings. They acknowledge and use information and data from a variety of sources and critically assess their quality. Creating with ICT Students create a range of ICT learning solutions developing their understanding, demonstrating their creativity, learning and supporting their thinking processes across or within curriculum areas. They analyse problems, needs and opportunities, exploring ideas, developing concepts and evaluating ICT learning solutions. They use processes to select appropriate ICT, generate ideas and plans, express themselves and monitor and reflect on their learning. Communicating with ICT Students use ICT to enhance communication. They share, interact, develop relationships and apply ICT to present information and data, engage with audiences and collaborate in meaningful ways. They use ICT to communicate face-to-face and remotely with individuals and with local and global communities. Students experience alternative views, construct new understandings and empathise with others. Ethics, issues and ICT Students understand the increasingly prominent role of ICT in society and its impact on self, work and others. They have an appreciation of the roles and responsibilities of people working with ICT and are discriminating, ethical, legal, responsible and safe users of ICT. Students use safe practices to protect information and develop strategies for handling unwanted communication. They reflect on ICT issues in the past and are able to apply future thinking when exploring the impact of ICT developments. 9 Introduction Operating ICT Students efficiently operate a range of ICT functions and applications for creating, communicating, inquiring and for the management, storage and retrieval of information and data. They competently perform operational sequences with a range of ICT and use features of the ICT to achieve curriculum outcomes. Students consistently apply standards and conventions when using ICT. They apply preventative strategies for maintaining ICT and solve basic ICT-related problems as end-users. 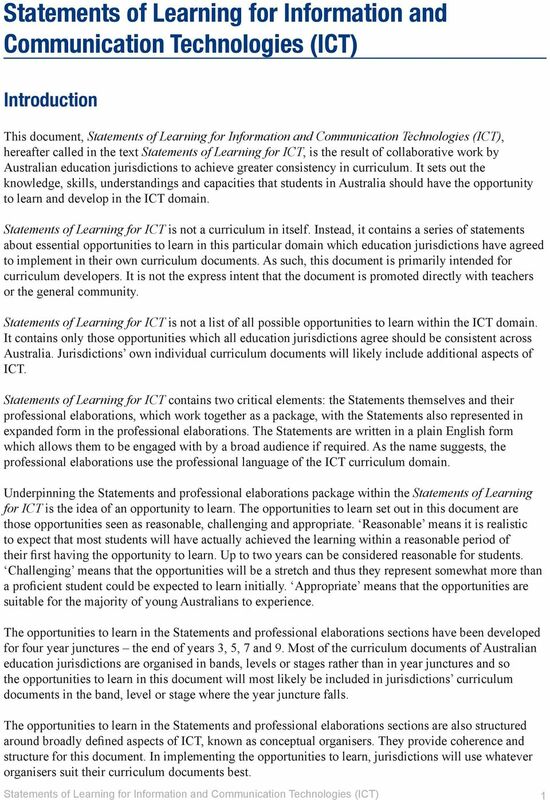 Reading the Statements of Learning and the professional elaborations The Statements of Learning for ICT and their professional elaborations have been designed to describe progressions of learning that are accessible and challenging at four year junctures of years 3, 5, 7 and 9. Each Statement of Learning and professional elaboration subsumes the knowledge, skills, understandings and capacities of the Statements and professional elaborations that precede it. It is important for curriculum writers to consider the Statements of Learning in ICT and the professional elaborations as a whole, in conjunction with the Introduction. As noted above, the professional elaborations expand upon and provide more specific detail that clarifies the intent of the Statements of Learning by making use of the technical language of ICT. The Statements of Learning for ICT do not attempt to address pedagogical issues. 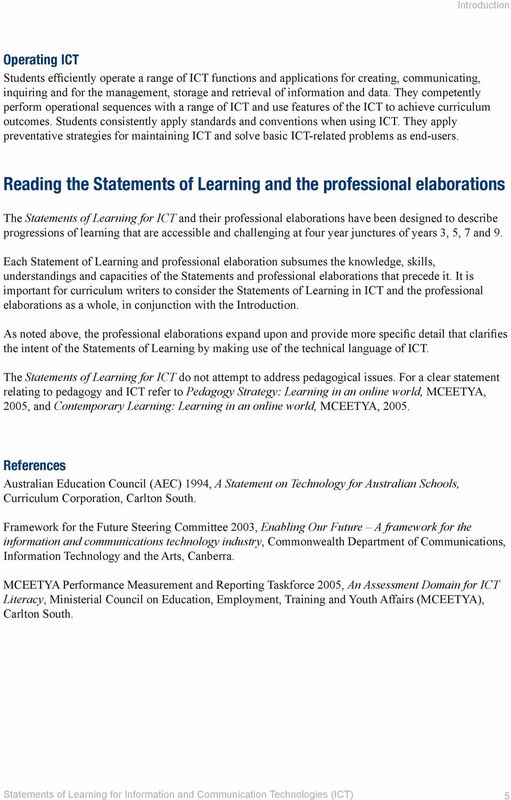 For a clear statement relating to pedagogy and ICT refer to Pedagogy Strategy: Learning in an online world, MCEETYA, 2005, and Contemporary Learning: Learning in an online world, MCEETYA, References Australian Education Council (AEC) 1994, A Statement on Technology for Australian Schools, Curriculum Corporation, Carlton South. Framework for the Future Steering Committee 2003, Enabling Our Future A framework for the information and communications technology industry, Commonwealth Department of Communications, Information Technology and the Arts, Canberra. MCEETYA Performance Measurement and Reporting Taskforce 2005, An Assessment Domain for ICT Literacy, Ministerial Council on Education, Employment, Training and Youth Affairs (MCEETYA), Carlton South. 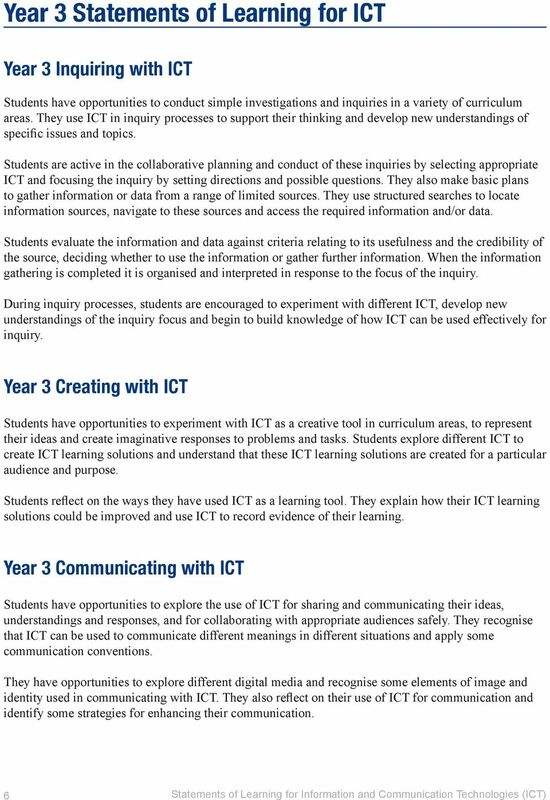 10 Year 3 Statements of Learning for ICT Year 3 Inquiring with ICT Students have opportunities to conduct simple investigations and inquiries in a variety of curriculum areas. They use ICT in inquiry processes to support their thinking and develop new understandings of specific issues and topics. Students are active in the collaborative planning and conduct of these inquiries by selecting appropriate ICT and focusing the inquiry by setting directions and possible questions. They also make basic plans to gather information or data from a range of limited sources. They use structured searches to locate information sources, navigate to these sources and access the required information and/or data. Students evaluate the information and data against criteria relating to its usefulness and the credibility of the source, deciding whether to use the information or gather further information. When the information gathering is completed it is organised and interpreted in response to the focus of the inquiry. 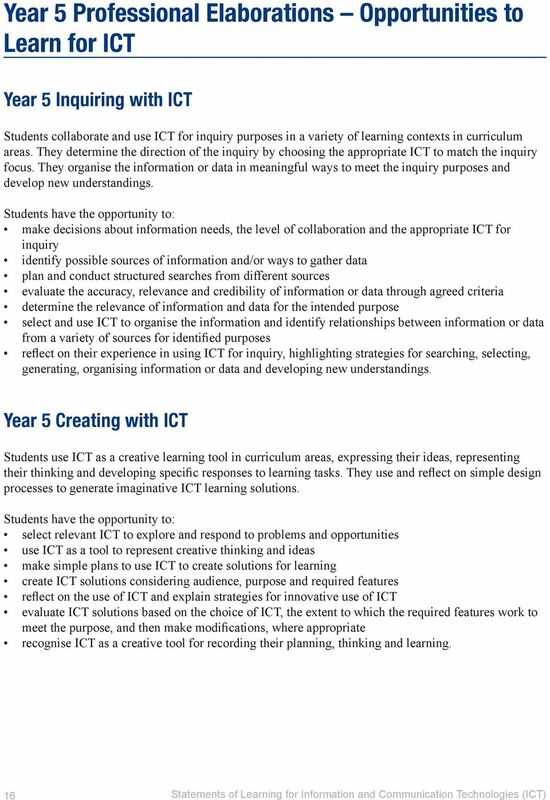 During inquiry processes, students are encouraged to experiment with different ICT, develop new understandings of the inquiry focus and begin to build knowledge of how ICT can be used effectively for inquiry. Year 3 Creating with ICT Students have opportunities to experiment with ICT as a creative tool in curriculum areas, to represent their ideas and create imaginative responses to problems and tasks. Students explore different ICT to create ICT learning solutions and understand that these ICT learning solutions are created for a particular audience and purpose. Students reflect on the ways they have used ICT as a learning tool. They explain how their ICT learning solutions could be improved and use ICT to record evidence of their learning. Year 3 Communicating with ICT Students have opportunities to explore the use of ICT for sharing and communicating their ideas, understandings and responses, and for collaborating with appropriate audiences safely. They recognise that ICT can be used to communicate different meanings in different situations and apply some communication conventions. They have opportunities to explore different digital media and recognise some elements of image and identity used in communicating with ICT. They also reflect on their use of ICT for communication and identify some strategies for enhancing their communication. 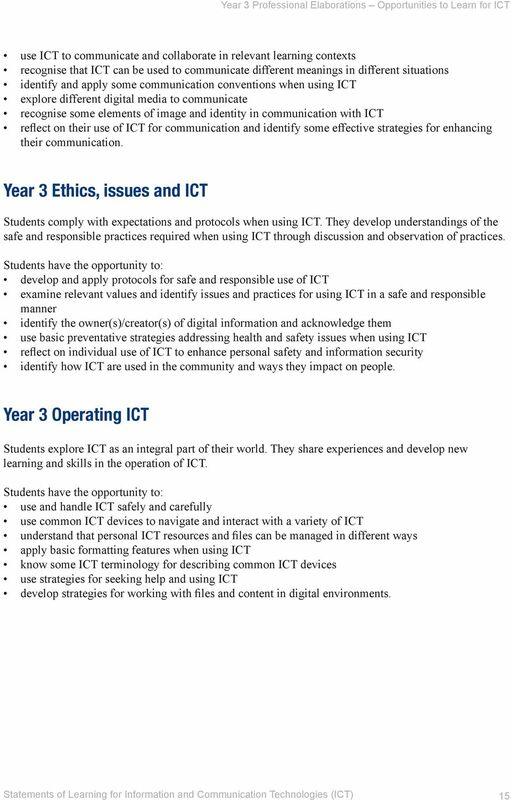 11 Year 3 Statements of Learning for ICT Year 3 Ethics, issues and ICT Students have opportunities to apply ICT protocols and appropriate ethical expectations. They develop understandings of the safe and responsible practices required when using ICT through discussion and observation of practices. Students examine the relevant values inherent in particular ICT environments and identify issues and practices for using ICT in a safe and responsible manner. They identify the owner(s)/creator(s) of digital information and acknowledge them. Students use basic preventative strategies for addressing health and safety issues and reflect on their personal safety and information security practices when using ICT. They identify how ICT is used in the community and recognise ways they impact on people. Year 3 Operating ICT Students explore ICT as an integral part of their world. They share experiences and develop new learning and skills in the operation of ICT. Students have the opportunity to use and handle ICT safely and carefully. They understand that personal ICT resources and files can be managed in different ways and have opportunities to apply basic formatting features. When working with files and content in digital environments students know some ICT terminology for describing common ICT devices and use strategies for seeking help. 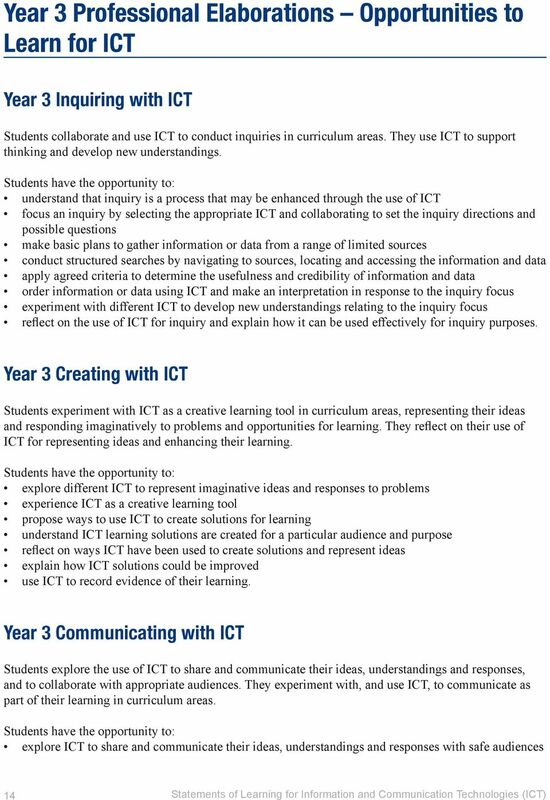 12 Year 5 Statements of Learning for ICT Year 5 Inquiring with ICT Students have opportunities to collaborate and use ICT to conduct inquiries for a variety of purposes in curriculum areas. They determine the direction of the inquiry and match the appropriate ICT to the inquiry focus. They organise the information or data in meaningful ways to meet the inquiry purposes and develop new understandings. 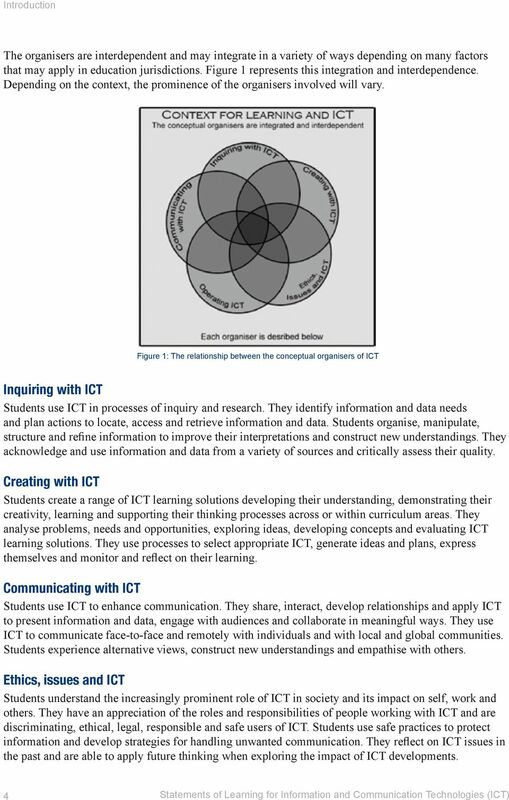 When students use ICT in the inquiry process they make decisions about information needed, the level of collaboration required and the appropriate ICT for the inquiry. They identify possible sources of information and/or ways to gather data, then plan and conduct structured searches from different sources. Students evaluate the accuracy and credibility of the information and/or data they have gathered and commence organising the information and identifying the relationships between the information and/or data from the various sources. They also evaluate the information for its relevance to the purposes of the inquiry. 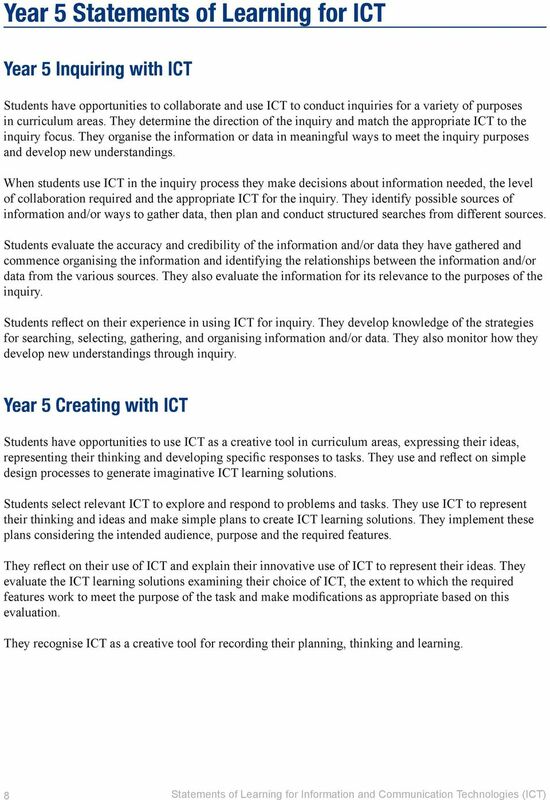 Students reflect on their experience in using ICT for inquiry. They develop knowledge of the strategies for searching, selecting, gathering, and organising information and/or data. They also monitor how they develop new understandings through inquiry. Year 5 Creating with ICT Students have opportunities to use ICT as a creative tool in curriculum areas, expressing their ideas, representing their thinking and developing specific responses to tasks. They use and reflect on simple design processes to generate imaginative ICT learning solutions. Students select relevant ICT to explore and respond to problems and tasks. They use ICT to represent their thinking and ideas and make simple plans to create ICT learning solutions. They implement these plans considering the intended audience, purpose and the required features. They reflect on their use of ICT and explain their innovative use of ICT to represent their ideas. They evaluate the ICT learning solutions examining their choice of ICT, the extent to which the required features work to meet the purpose of the task and make modifications as appropriate based on this evaluation. They recognise ICT as a creative tool for recording their planning, thinking and learning. 13 Year 5 Statements of Learning for ICT Year 5 Communicating with ICT Students use ICT to communicate with a range of identified audiences. They share ideas, responses, understandings and information, and collaborate for learning purposes. They understand that communication with ICT varies in different social and cultural contexts and use appropriate conventions for the intended audiences and specific purposes. Students have opportunities to use different digital media to improve the communication of ideas, express a personal image and establish an identity. They reflect on experiences to analyse the delivery and effectiveness of the communication. 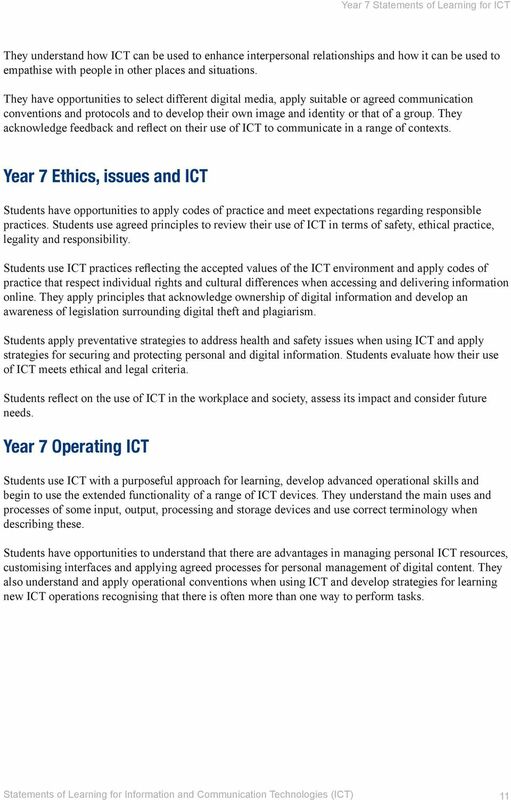 Year 5 Ethics, issues and ICT Students apply codes of practice that promote safety, responsibility and respect when working in online and stand-alone environments. They examine practices in a variety of ICT environments to recognise the underlying values. They recognise the importance of acknowledging the owner(s)/creator(s) of digital work and establish sound practices for acknowledging them. Students implement a range of preventative strategies for addressing health and safety issues when using ICT and develop and apply strategies for the security of personal information. 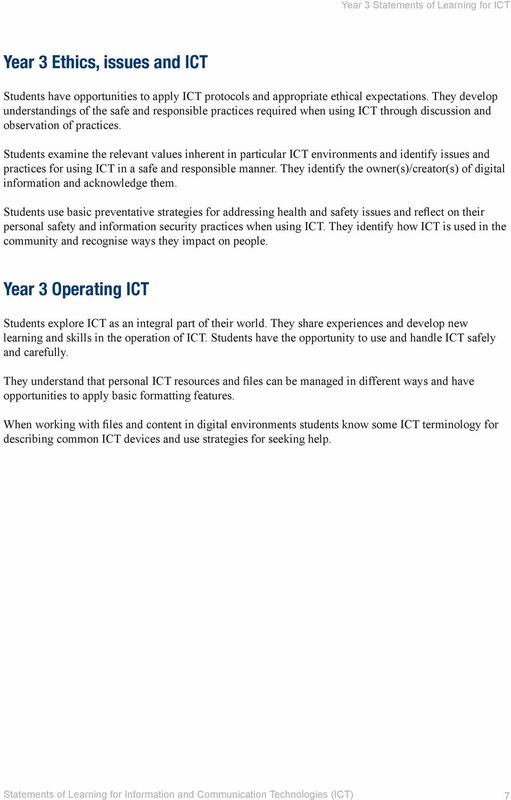 Students understand how ICT are used in the workplace and reflect on their impact in society. Year 5 Operating ICT Students use ICT in purposeful ways. They gain new understandings of operational processes through sharing and experimentation. Students have the opportunity to use the basic capabilities of a range of ICT devices. They distinguish and make selections between common ICT devices and access appropriate network, personal system and device information. They have opportunities to understand that the management of personal ICT resources affect operational efficiency and adopt some recognised ICT conventions. They use ICT terminology to describe some common ICT devices and processes and develop and apply help strategies for effective use of ICT. They also describe some management processes when working with content in digital environments.